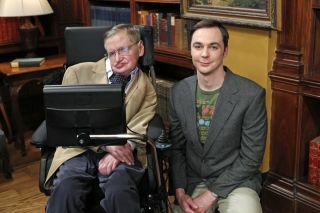 Stephen Hawking poses with actor Jim Parsons on the set of "The Big Bang Theory." The world lost one of its most brilliant minds today (March 14) when the renowned theoretical physicist Stephen Hawking passed away at the age of 76. As a physicist, Hawking rose to fame for his work on black holes and the origins of the universe. He was also a stellar science communicator who authored several best-selling books that made astrophysics and cosmology accessible to people with no scientific background. But Hawking was also someone with a remarkable sense of humor, which he maintained even as he suffered from a degenerative nerve disease that left him bound to a wheelchair for life.